Wartburg Castle has been put on the WH List because it is seen as a "outstanding monument of the feudal period in central Europe". The origins of Wartburg Castle date back to 1067. In that year a watching tower was constructed here by Ludwig der Springer. Its current imposing shape started to develop with the construction of the Palas (the main body) in 1155. The Landgraves of Thuringia owned and expanded the castle from that time until the 15th century. The castle's history has been coloured with theological and artistic highlights rather than for military reasons. During 1521 and 1522 for example, Martin Luther lived here in exile. He made good use of his time by translating the New Testament into German. A surprise visit this one was. After spending the Easter weekend in Weimar, I noticed I had to pass Eisenach to drive back to Holland. And my way-too-big-to-be-handy Germany road map showed "Wartburg Castle" next to Eisenach and the motorway. So I just had to take the chance. I always enjoy the anticipation that is involved in visiting sites unprepared. Will I be able to find it? I hope it isn't closed today! What's the story behind this site anyway? The castle is well-signposted in Eisenach, even in Japanese! As castles go (and monasteries), Wartburg is located strategically on the top of a hill. According to reports I've read, the view from here on the surrounding countryside must be marvellous. However the weather was so misty that morning that I didn't see the castle until I arrived at its bridge. The castle has a quite unusual shape, a bit bulky. With a guided tour I visited its interior (I even had to queue to gain entrance, this is a really popular sight). In some rooms only the Romanesque design can be admired (the 12th and 13th century ones), others are brilliantly decorated (the ones that date from the 19th and 20th century). I finished my well-spent morning with a local Thüringer Bratwurst, providing more than enough calories to burn during the six hour drive home. Although you can get up to the castle and see the outside of it for free, it’s only possible to go inside with regular guided tours. Inside the castle, the evidence of styles of even more generations is on display. From beautiful golden mosaics, to magnificent frescoes, to the ornate decorations of the Festival Hall, the artwork tells the story of the castle’s history through the images and through its influences. It really is not worth going to the castle and not taking the tour. 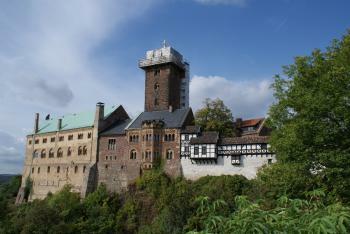 The Wartburg is the iconic German castle, known worldwide for its association with Martin Luther. Even though it was constructed in the 11th century, today's appearance largely dates to the 19th century and shows this period's imagination of what a medieval castle might have looked like. Historically, it is important first and foremost for Luther's stay in 1521/22, when he hid from the Pope and the Emperor and translated the Bible into German, thereby giving rise to the modern German language. Also, St. Elizabeth of Thuringia lived there in the 12th century, and in 1817 and 1848, the so-called Wartburg Festivals took place there, which led to the movement to create a democratic and united Germany. For today's visitors, there is a bus line leaving right from the train station in Eisenach, which, however, does not reach the entrance. A rather steep walk (or donkey ride) is also required. Inside, you can see everything you would imagine a medieval German castle to be, but of course, not everything is really original. 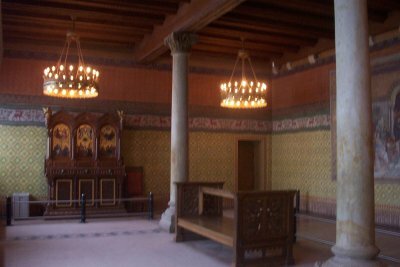 The guided tours are quite interesting and take you to the highlight, the room where Luther pored over his Bible translation and allegedly threw an inkwell at the devil who dared to distract him. I visited on Reformation Day (not intentionally), and the castle was very crowded, but still, it was a nice experience, not least for the great views over the surrounding hills and forests coloured by a crisp Indian Summer day. I visited this WHS in June 2013. I drove here by car early in the morning - and a pleasant drive it was ... sunshine, a cool breeze, winding roads and then the castle itself. The 5 Euro parking ticket seemed to be rather excessive and a bit of a tourist trap (a bit like Kinderdijk's parking lot and other UNESCO parking lots). I was there early on purpose to avoid the crowds. The highlight of the castle's exterior was the different style and material used to build this peculiar castle. The tower offers interesting courtyard views (you have to pay 50cents to climb 2 flights of steps). The best views I enjoyed were those just before the castle entrance (next to the iron cannons). The interior of the castle was a pleasant surprise. The only way to visit is with a German speaking guide (considering that this is a very popular national heritage and a WHS, a little leaflet with the commentary in other languages should be offered to foreign tourists and should be that difficult to organise I suppose!). I understood most of what was being said anyway but there were others in my group who couldn't follow what was being said. Still, the visit is very interesting for what you get to see and my personal favourite was the Ladies' Chamber with beautiful mosaics and Martin Luther's Room for its historical value. Photography without flash is allowed inside. In general, castles and palaces are not my favourite kind of WHS. But Wartburg Castle is an exception. I was there twice: on a foggy winter day in 1990, shortly after the fall of the Berlin Wall, and in the summer of 2009. Both times the atmosphere was different, but whatever the weather the location on a narrow, steep ridge is stunning. And obviously King Ludwig II of Bavaria was also impressed by the Wartburg. There he got a lot of inspiration for his Neuschwanstein Castle. The Wartburg Castle was never destroyed by war and thus it is a mixture of different architectural styles: Romanesque, Gothic, Renaissance and Historicism. The entrance gate and the half-timbered buildings of the outer bailey are from the 14th and 15th Century, the middle parts are from the mid-19th Century, and the main castle, the Palas, is in the Romanesque style. The entrance to the courtyards is free, but despite the queues a tour of the interior is worthwhile. 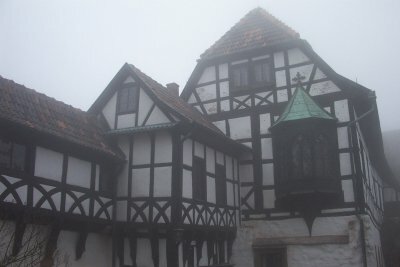 The Wartburg was significant for many periods of German history, and references can be seen inside the Palas. Noteworthy is the simply designed Romanesque knight's hall with its cross vault. In 1206, the Wartburg was the scene of the Minnesingers' contest. Although this is a legend, it has a historical background. 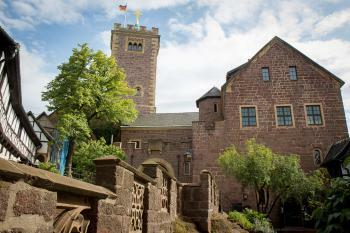 At that time, the Wartburg was a famous centre for European arts and culture. The Thuringian landgrave Hermann I invited well-known poets and singers to stay at the Wartburg. However, the design of the Singers' Hall is a product of the imagination of the 19th Century. In the 13th Century, Saint Elizabeth of Hungary lived here. 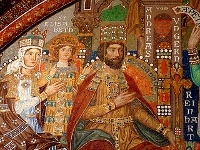 Scenes from her life are depicted in the Elizabeth bower, the walls and vault are decorated with colourful mosaics from the early 20th Century. And of course you can visit the sparsely furnished room where Luther translated the New Testament. In 1817, the Wartburg festival took place at the Wartburg Castle, an important event for the student fraternities who fought for a united German state. One of the highlights of the guided tour is the festival hall. Its ornate decoration made it one of the best examples of Historicism. 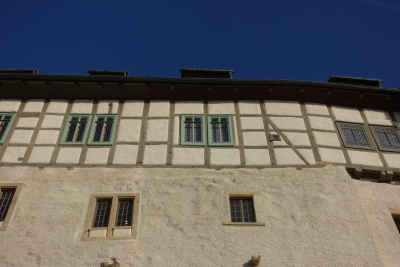 Those who were impressed by the festival hall in the Neuschwanstein Castle can admire the original at the Wartburg. 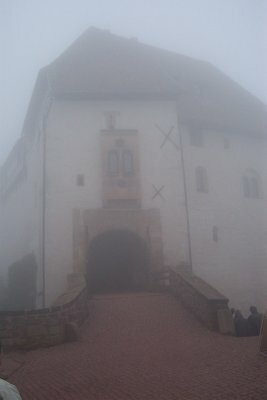 I visited Wartburg in late November, 2008. A little snow made the landscape delightful. Wartburg is superb and you really must do the guided tour. Room after room of surprises and majestic architecture, paintings, tapestry. The Elisabeth bower was sublime. The articles in the museum section were incredible. I was truly enlightened about German history and ingenuity. You must take the opportunity to detour to this site. I have been there in 2000 and I loved it. The view is great. If you can go check out the minas also. I marvel at how the WARTBURG sits so majestically on that hillside overlooking Eisenach. One can understand why it was one of Martin Luther's favorite places to visit as you feel like your setting on top of the world. I been there several times and find it facinating on every visit. The Wartburg Castle is absolutely magnificent. I have no other experiences with castles to compare it to, and from living in Eisenach for two months I understand from the citizens that many consider it to be 'not a real castle' because of the fact it is so renovated; however, I still think it is a wonderful piece of architecture and history. The tour guide does an excellent job of relaying in English what the castle involves, the deep, rich history, and many important aspects of it's existence. I was also able to meet the owner, he is a lovely man....everyone who works there, works hard to ensure the castle remains as great as it was. I would highly recommend coming to Eisenach and staying, going to the castle, and just enjoying the town. Everyone is extremely nice, and we had an easy time getting around without a lot of German language experience. Breath taking, incredable, wonderful, amazing. Go see it if you can. Cisterns: The centre of the lower courtyard is occupied by a cistern. Historical Graffiti: Graffiti from the Middle Ages on a door in Wartburg Castle. Also graffiti (a signature in Cyrillic) left by Peter the Great in the room where Luther translated the bible.